Halloween is the time of year when food gets its freak on, with supermarkets across the land trying to out-weird each other with ‘out there’ colours and flavours. So far, Morrisons appears to have their Halloween game brewing nicely, serving up the kind of pizzas I imagine Gomez and Morticia Addams might order in for a family movie night. 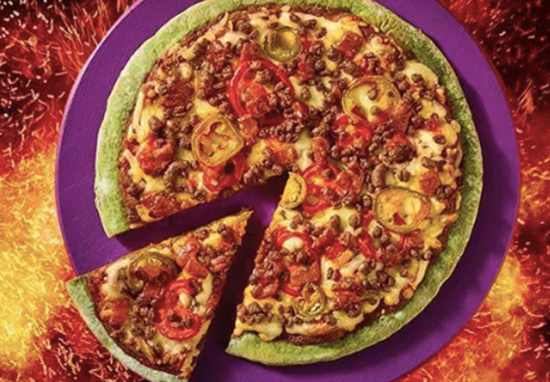 Picture a ghastly green base and a spice level which will blow the bolts out of your neck, and you are on the right (ghost train) tracks for Morrisons’ deliciously demonic 10-inch Halloween pizza. The crust gets its mouldy grave stone tinge from a clever infusion of spirulina, an edible form of algae. And things gets even scarier once you take a bite. Definitely a treat for adventurous eaters, the sauce is made with the third hottest chilli in the world; the notorious ghost chilli. A searing 200 times hotter than jalapeños and 200 times hotter than Jalapeño chilli, this chilli has a Scoville rating of one million and really isn’t intended for those who wimp out at the last minute in the Subway queue. And this isn’t the only chilli going on here. The cheddar cheese, known as ‘R.I.Pizza’s Reaper chilli cheddar’, has been made with the infamous Carolina Reaper, aka the hottest chilli on the planet. Now, this reaper may not be swinging a scythe, but it is still a force to be reckoned with, being 300 times hotter than jalapeño chillies or Tabasco sauce. This absolute monster measures 2,200,000 on the Scoville Scale, with the capacity to leave your tongue a singed ruin of its former self. And if you thought you might get let off lightly with the toppings, think again. Spicy beef and jalapeños are scattered all over the bombastic base like great balls of hellfire. Each petrifying pizza costs a not too frightening £2.50 and will be available from Morrisons’ pizza counters nationwide throughout the spooky season. The dish looks like a zombie, and will make you scream like there is one lumbering after you. This autumn, it seems pizza proprietors are all about bringing us an unreasonable amount of spice, setting our plates and mouths ablaze. 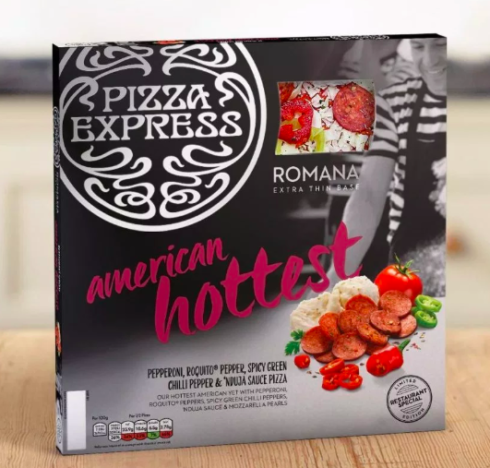 Pizza Express are currently selling their hottest ever pizza, American Hot, in Waitrose with a fire risk inducing ‘nduja (spicy sausage) sauce. After its success in restaurants, we’re pleased to bring the American Hottest to supermarket shelves for everyone to enjoy at home. Topped on our thinner and crispier Romana base, using two different types of chilli and ‘nduja sauce, it is perfect for those who like it hot and with our Formaggi Dough Balls, what’s not to like? The ideal treat – or trick – for your Halloween feast. But, as a self-confessed Korma orderer, I think I’ll stay clear for now….